Current Temperatures At 3 PM MST. 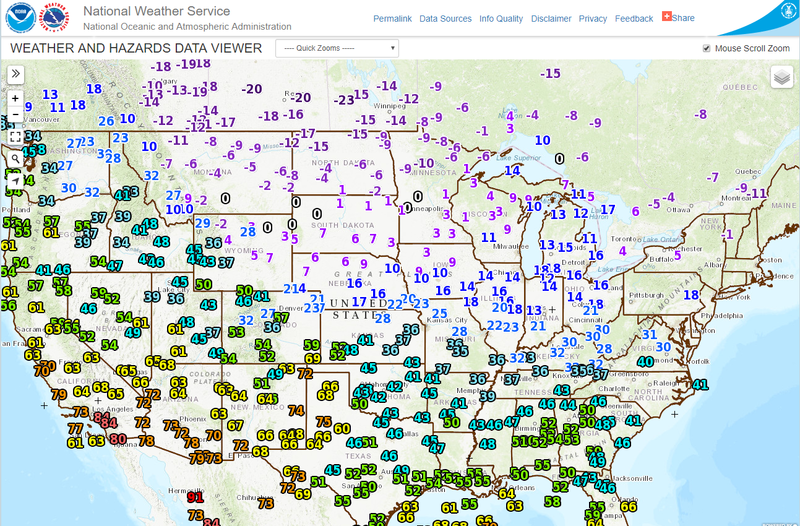 U.S. Temps & Wind Chill At 3 PM MST. Temperatures across the Yukon of far Northwestern Canada as of 3 PM MST this Friday afternoon and ranging from -30ºF to -42ºF. 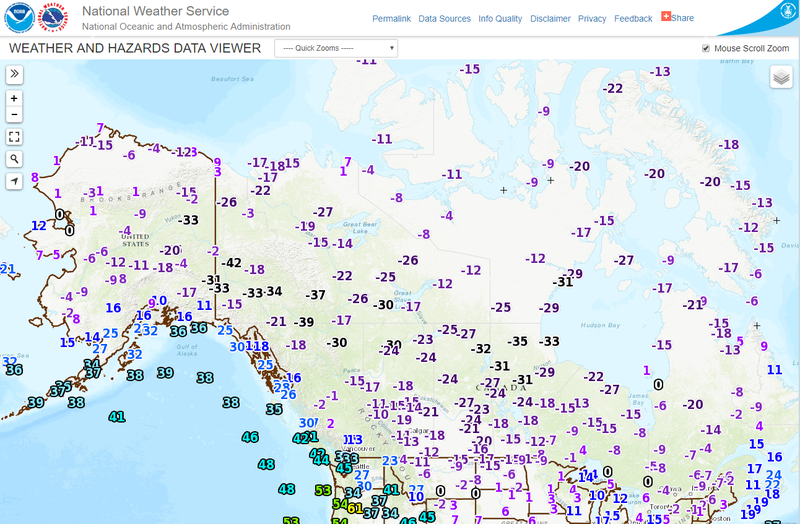 Wind chill values across Northwestern Canada from the U.S. border northward are ranging from -30ºF to -51ºF. 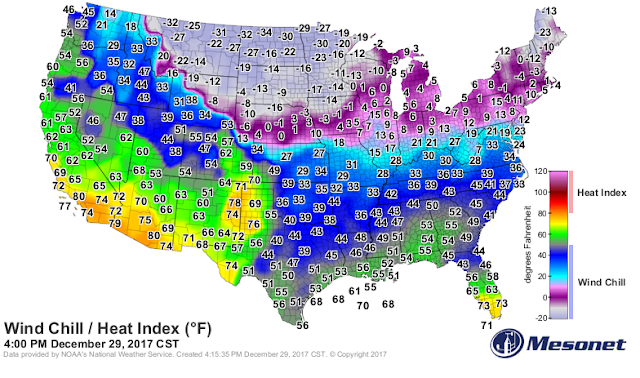 This is the long awaited arctic air mass that is already moving into the northern plains this afternoon. 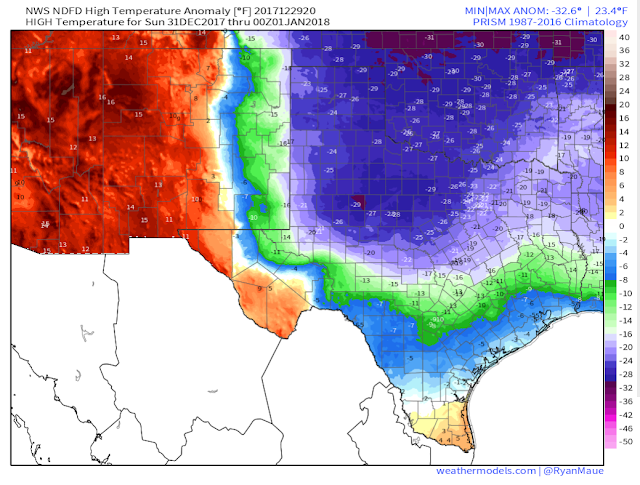 This will be the source of our cold New Years weather locally. Fear not this air mass will not be anywhere near that cold by the time it arrives here. 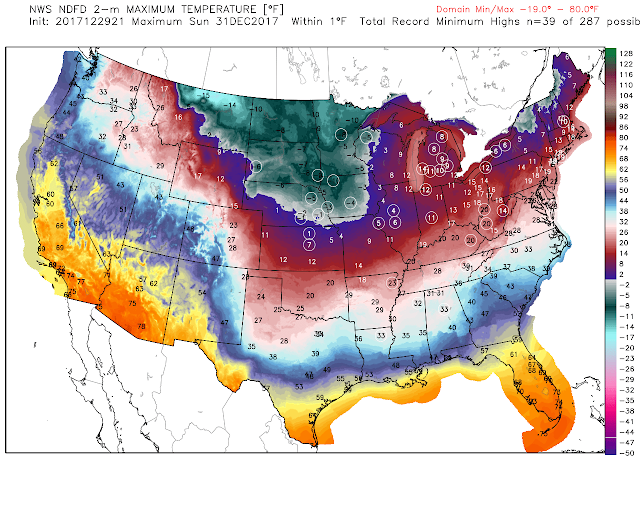 Cities Circled Are In Danger Of Breaking Their Daily Low Maximum Temperatures. Arctic Front Arrives Saturday Afternoon. NWS NDFD Forecast High Temperatures & Temperature Anamolies. 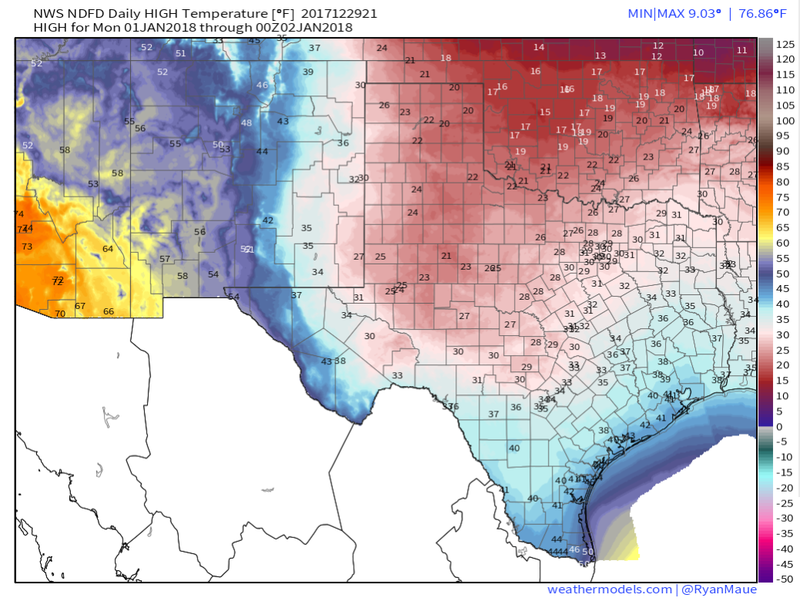 Saturday afternoon will be interesting as the first surge of the modified arctic air mass arrives locally. Current forecast warm Southeastern New Mexico and parts of West Texas up into the low 70's ahead of the southward moving cold front. 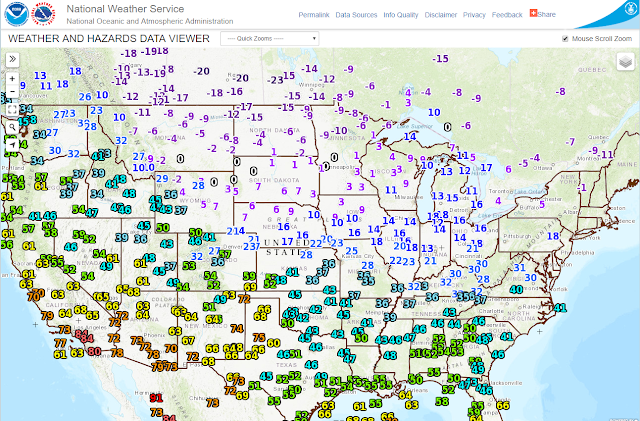 These readings will be some 10ºF to 20ºF above normal for the date. 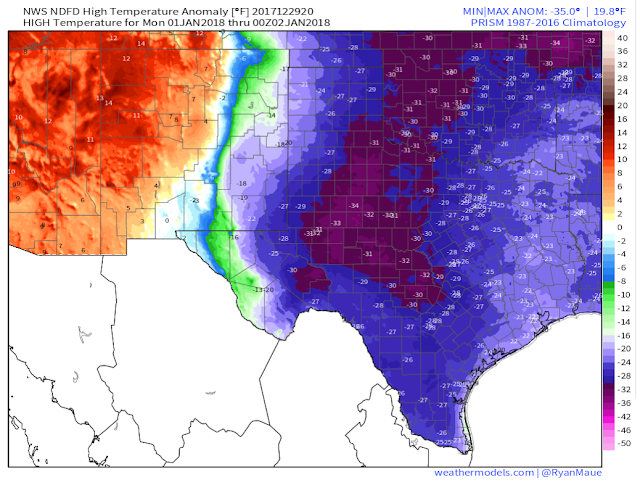 Notice the temperature contrast between the Pecos Valley and West Texas just east of the state line. Should the front arrive quicker than forecast then we won't get this warm. 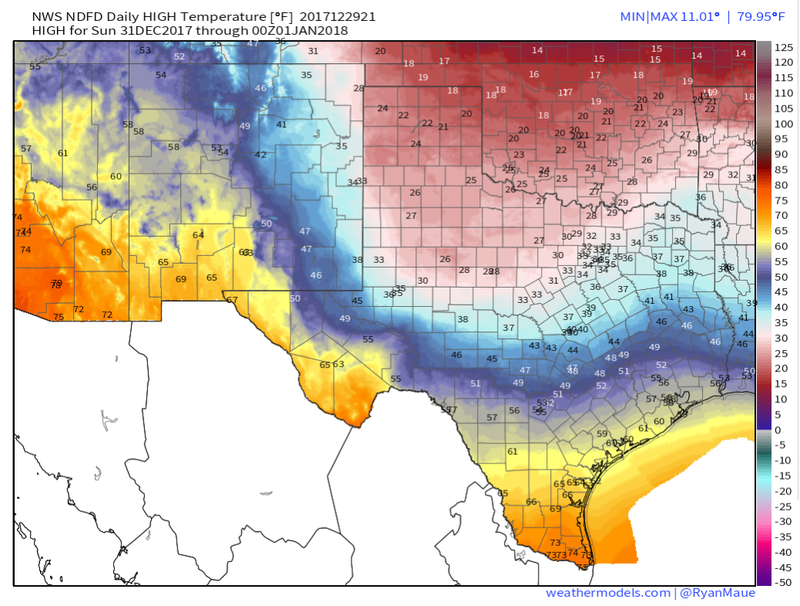 A slower front will mean slightly warmer temps. 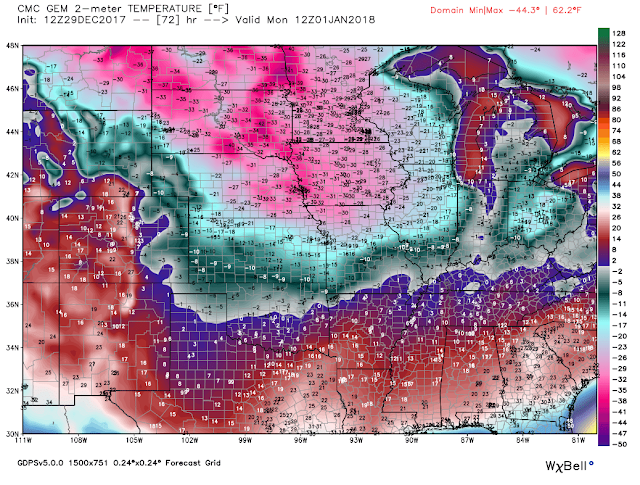 Sunday could prove to be equally as interesting depending upon the timing of the arrival of the stronger and colder surge of arctic air backdooring into the local area. We could see high temps in the 50's if this second surge is slower than forecast or only the 20's and 30's if its faster than forecast.Sundays high temps will be some 6ºF to nearly 30ºF below normal for the local area. 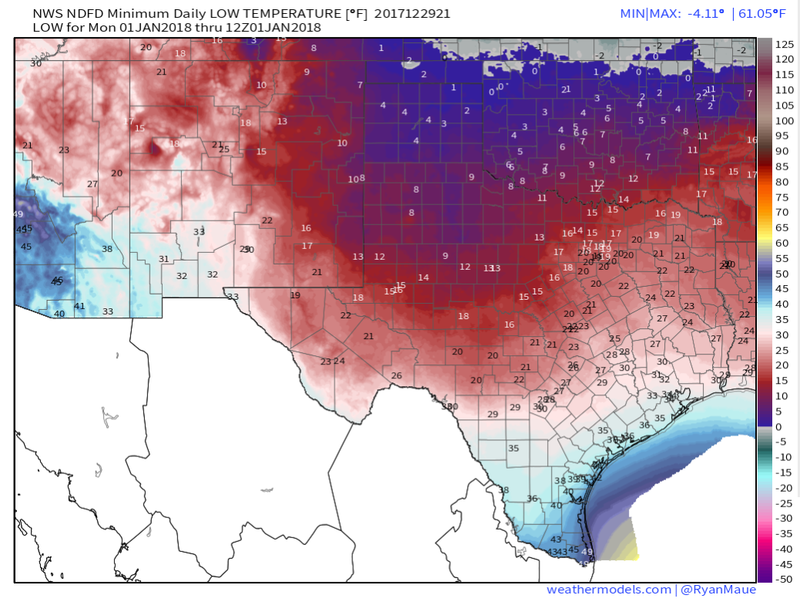 New Years Day Low Temperatures. 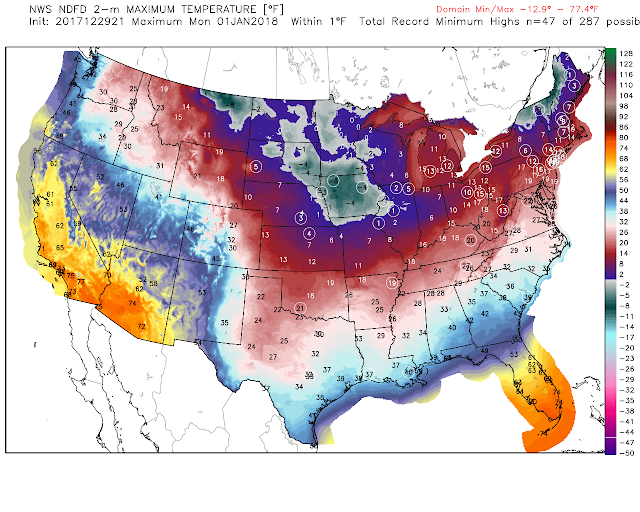 New Years Day High Temperatures. New Years Day High Temperature Anomalies. 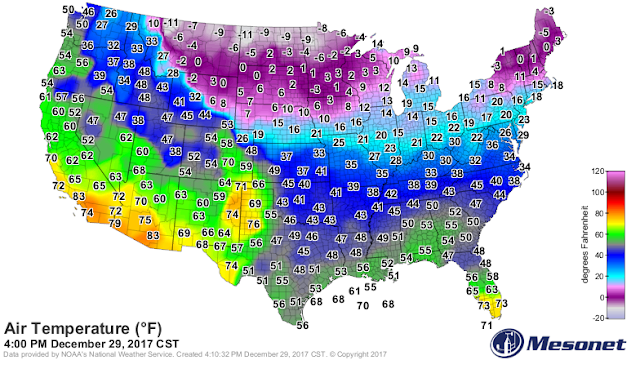 New Years 2018 starts of cold with current forecast low temperatures ranging from the single digits near the state line to the teens locally. Wind chill values likely will be in the 0ºF to -5ºF range across Southeastern New Mexico to -5ºF to -15ºF across parts of West Texas east of the state line. If this air mass is colder than forecast then our wind chill values Sunday night into New Years Day morning will also be colder. High temperatures New Years day are forecast to be in the 20's and 30's across the local area...with a biting wind chill to boot. These readings will be some 20ºF to 35ºF degrees below normal for the date. 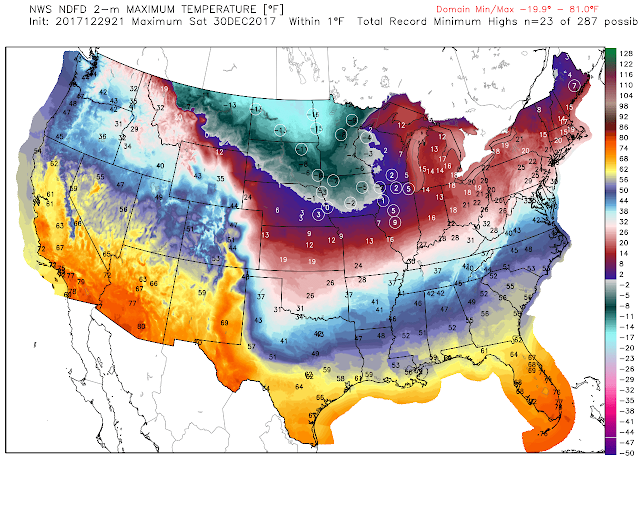 Canadian GEM Has Coldest New Years Forecast. Forecast Temperatures At 5 AM MST. This mornings run of the Canadian model is the coldest of the three (GFS, ECMWF, GEM) and its brings single digit lows along the state line. Forecast Temperatures At 5 PM MST. 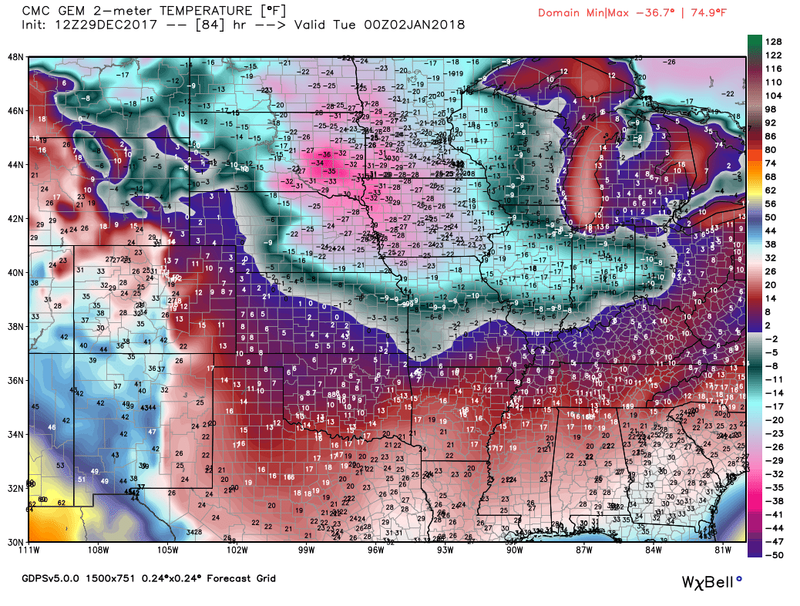 It forecasts widespread 20's for highs on New Years. Normal Highs & Lows For New Years. 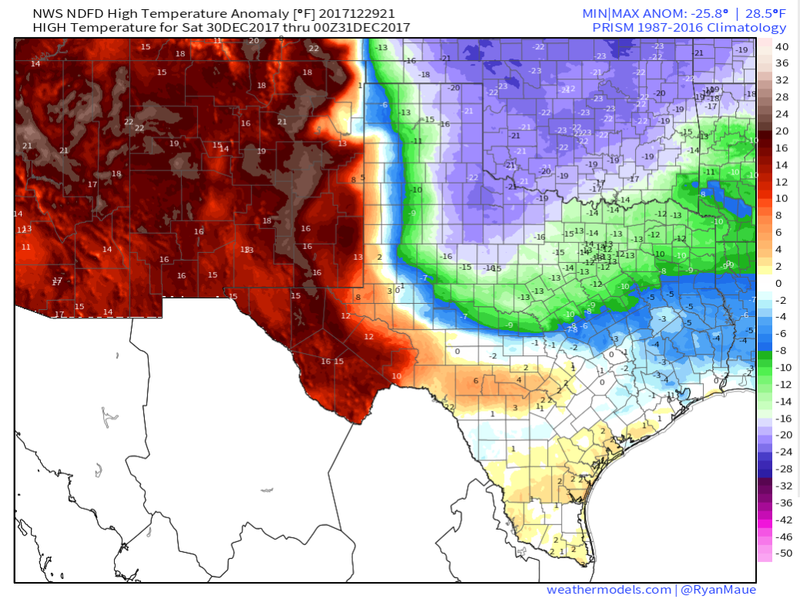 (And Record Low Max Temps & Record Lows). 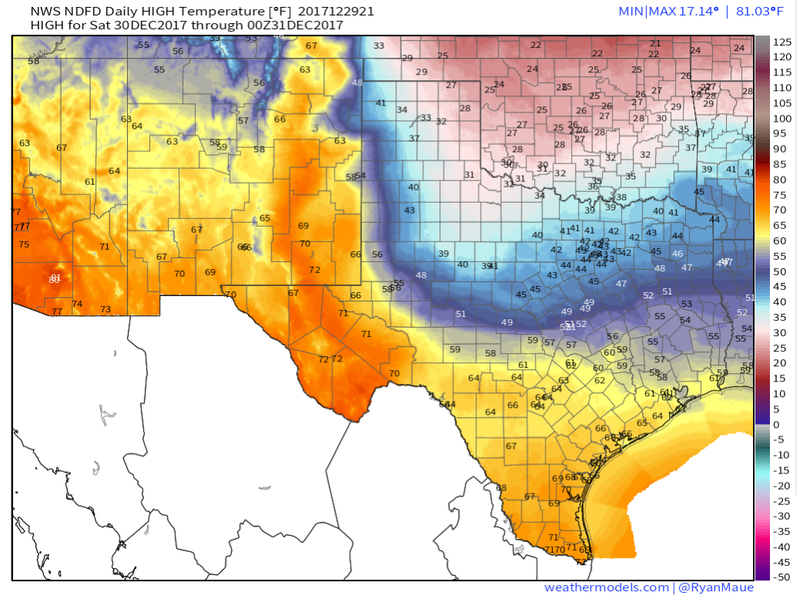 So be prepared for three days of below freezing temperatures starting Sunday lasting into Tuesday.